From Pluto to the Sun -extrapolation 1- (non linear scales) [De Pluton au Soleil -extrapolation 1- (échelles non linéaires)]. A virtual Earth-like planet (dark blue) is added to the actual Solar System; its trajectory is located between the one of Saturn and the one of Uranus. 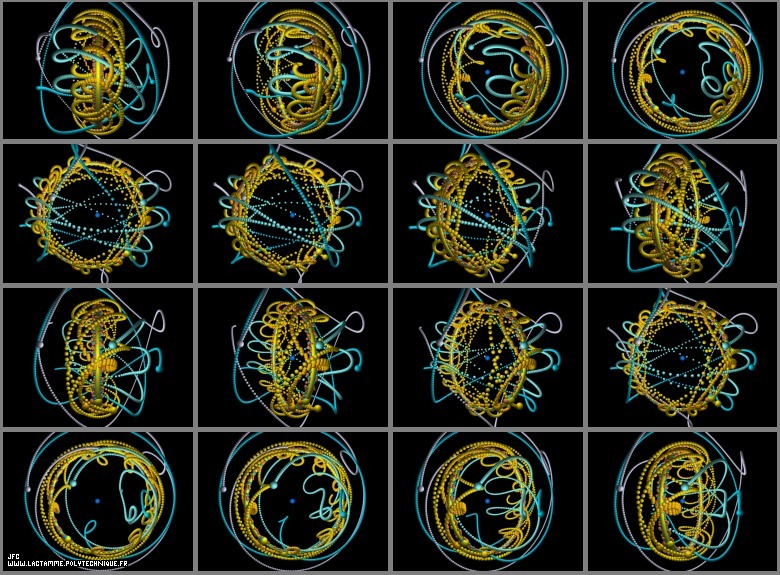 Each frame of this animation displays a particular trajectory of this planet when 2.pi rotated (see figure "The journey of an Earth-like planet (dark blue) between Saturn and Uranus"). Each of these trajectories has a duration equals to one plutonian year. For each of these intermediate trajectories, the 11-body system is visualized with the virtual planet at the origin of coordinates. The relative trajectories look non periodical and even chaotic. What kind of science -astronomy in particular- could be developped in a such non regular context?